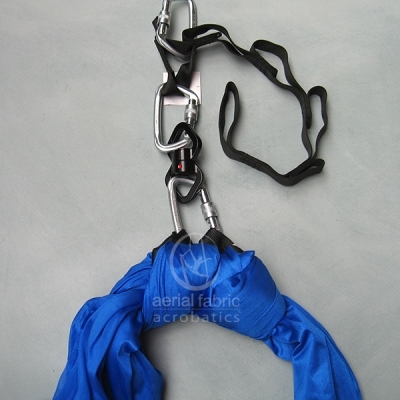 Assembled as a Flying Yoga Trapeze Hammock with Loops for Hands or Feet. 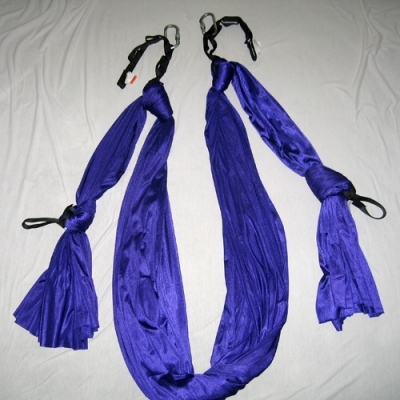 Kit converts to a Single Point Yoga Hammock, or to an Aerial Dance or Aerial Silks set up that has a single point. Includes: One Swivel, two 9 inch black sewn web loops, two 12 inch black sewn web loops two 24 inch black web multiple links, 3 steel screwgate carabiners, Tricot with Shine Fabric that we stock. The answer for versatile use! Our Flying Aerial Hammock/Aerial Dance Kit converts to a single point to use for aerial dance, or a single point Aerial Yoga Hammock. The kit can also be assembled, as a Flying or Trapeze style Aerial Yoga Hammock with loops for hands or feet. It can be used as a Double Point Hammock. Instructions are included for assembling your kit in any of the options as a PDF. 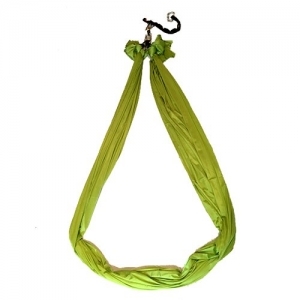 Comes assembled with 9 yards of Aerial Fabric as a Flying Yoga Hammock and the hardware is included to convert your Flying Hammock to a single point Aerial Hammock, or an Aerial Dance set up. The Kit has 9 yards of Tricot with Shine Aerial Fabric that is assembled to two 24 inch multiple links giving height versatility, and has two 13 inch black sewn web Loops for hands or feet. Loops are assembled for you, but you can change the height or length of the loops depending on ceiling height and use. 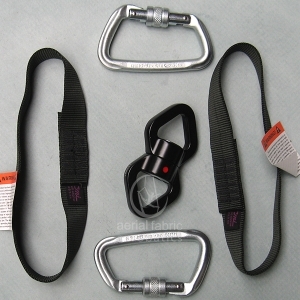 Comes with one swivel, two black sewn web 9 inch runners and three steel screwgate carabiners. This hardware is used to convert your flying hammock kit to either an aerial dance set up or a single point aerial hammock. Comes as a Flying Yoga Hammock with 11 yards of Aerial Fabric and the hardware to convert your Flying Hammock to a single point Aerial Hammock, or an Aerial Dance set up. 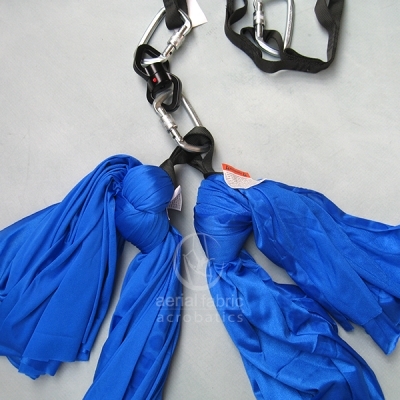 Comes assembled with 11 yards of Tricot with Shine Aerial Fabric that is assembled to two 24 inch multiple links giving height versatility, and has two 13 inch black sewn web loops for hands or feet. Loops are assembled for you, but you can change the height or length of the loops depending on ceiling height and use. 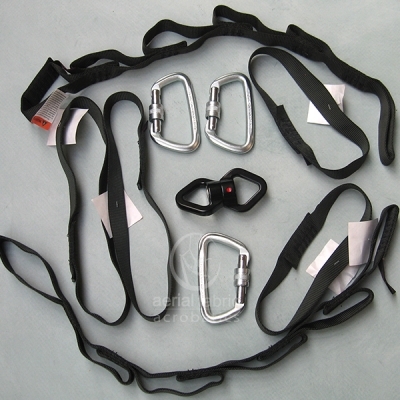 Comes with one swivel, two black sewn web 9 inch runners and three steel screwgate carabiners. This hardware is used to convert your flying hammock for either an aerial dance set up or a single point aerial hammock. See our Answers Section for more information on dynamic load. 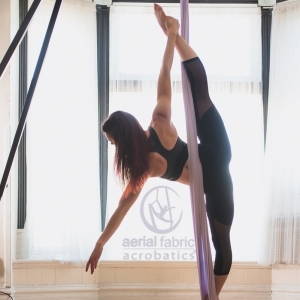 Aerial Fabric is also called Tricot. It is 100% Nylon, 40 denier (thread thickness). Made in the USA. The fabric is stress tested and breaks at 2,000 pounds. A strength certificate can be provided upon request. Black sewn multiple links are 1″ wide, rated at 28.9 kN or 6,497 pounds of force. The multiple link is rated at 4,000 pounds of force end to end with each loop rated at 3400 pounds. Black Sewn Runners rated at 28.9kN or 6,497 pounds of force.Made in the USA. Swivel is rated at 36kN. Working load 5kN. USA product. Wash fabric in a washing machine on gentle cycle, use liquid soap like Woolite, do a second rinse of cold water to clean soap from fabric. Check Runners and multiple links for any fraying. Replace if there is fraying of any type. Swivels need to be checked frequently to see that they spin freely with no grinding. If they are hard to spin, purchase a new swivel.